Noise pollution is generated by road, railroad and air traffic as well as by industry aggomerations in densely populated areas. In the European Union roughly 80 million people are exposed to increased noise levels in their direct surroundings. This is why the EU Commission views environmental noise as one of the major environmental problems in Europe. When the Environmental Noise Directive 2002/49/EG (END) became effective on June 25, 2002, it provided a Europe-wide concept for the assessment and management of environmental noise in order to avoid, prevent or reduce the harmful effects of environmental noise. Noise pollution is a Europe-wide problem. For example, the results of the first END noise mapping showed that in Germany, the level of noise pollution in many cities and municipalities is too high. The Europe-wide noise mapping by the EEA (European Environment Agency) revealed a similar situation. For roughly 56 million people living in large agglomerations, it records a level of road traffic noise of Lden > 55dB(A) . 53% of the population in large agglomerations is thus massively affected by noise pollution. The goal of sustainable noise reduction requires the efforts of all involved parties, as well as the consistent use of proven sound protection concepts. In Germany, sound protection installations are regulated by the technical requirements and guidelines for the implementation of noise barriers along roads of the Federal Ministry of Transport ZTV-LSW 06, and by the European Standard EN 14388. The most effective measure remains the reduction of noise at the source, meaning reducing the noise emerging from vehicles. This includes reducing traffic as well as the large-scale introduction of noise-reducing tyres and road surfaces. The measures to reduce unavoidable noise at its source are divided into proactive and passive noise reduction measures. Passive measures are sound insulation improvements on buildings, such as sound protection windows and doors as well as sound- buffering reinforcements in exterior walls and roofs. Proactive meaures include measures like traffic planning with regard to noise reduction. Sound protection walls and other sound-absorbing barriers can effectively reduce noise in sensitive areas. The Makrolon® SilentSound series from Bayer MaterialScience GmbH sets new standards in sound protection and safety. The transparent solid polycarbonate sheets are visually appealing, highly sturdy and offer special sound insulation for sustainable noise reduction at highways, speedways and railway lines. Unlike many conventional materials for sound protection walls, the sheets bring not only light but also colour to traffic roads. The transparent components are offered in green, yellow, blue, and in any custom colour. The actual protective effect of a sound insulation naturally depends on numerous factors, such as the length and height of the wall, the height of the noise source, and the distance between the wall and the noise source. Testing by the Fraunhofer Institute for Building Physics, Stuttgart, Germany, demonstrated that a Makrolon SilentSound sheet of 18mm thickness with a weight of approx. 22kg/m2 reduces noise pollution by a noticeable 34dB(DLR). The comparison with conventional sound insulation walls shows the outstanding effect of polycarbonate sheets. At their best, conventional sound protection walls reduce the noise by a maximum of 20dB(DLR). The transparent solid polycarbonate sheets fulfill the requirements of sound protection at traffic roads, and they are certified according to DIN EN 1793-2. Makrolon sheets are unbreakable and the splinter-free material has excellent processing properties. Whether they are cold-bent or installed flat, the sheets require little mechanical effort even for intricate building geometries. The material can be processed speedily, break-free and safely on site, thus saving time and costs. Curved sound protection walls, where the sound is reflected at an earlier stage, also offer significantly better protection than straight structures, which must be built higher. 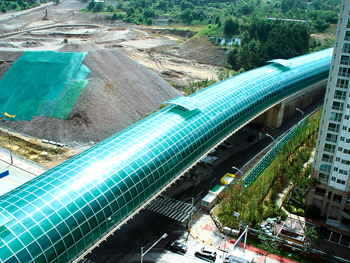 Due to the low weight of the polycarbonate sheets, this resistant material is perfectly suited for use in bridges. The solid carbonate sheet is offered in two variants: “Extended UV” and “Abrasion-resistant” (AR). A special co-extrusion coating lends the first type extended UV protection and superior weatherability, which ensures the high resistance of the material over a long period of time. The solid sheets are fireproof according to DIN EN 1794-2 Annex A. The structural properties of the sheets are in compliance with the European Guideline ETAG 10. Bayer MaterialScience regularly commissions tests to verify light transmission, hail resistance and impact of stones according to DIN EN 1794-1 Annex C. Even massive impact such as bullets or other willful destruction affects the material only minimally. The pendulum impact test and the drop hammer impact test according to DIN-EN 1794-2:2009 Annex B confirm the high resistance of the material against falling debris. The sheets, including the special 8mm thick ones, comply with the guidelines defined by various Indian Institutes and departments.